Charles Ryan's Flying Adventure: Flying on Eastar Jet's Boeing 737-700 from Jeju to Seoul Gimpo! 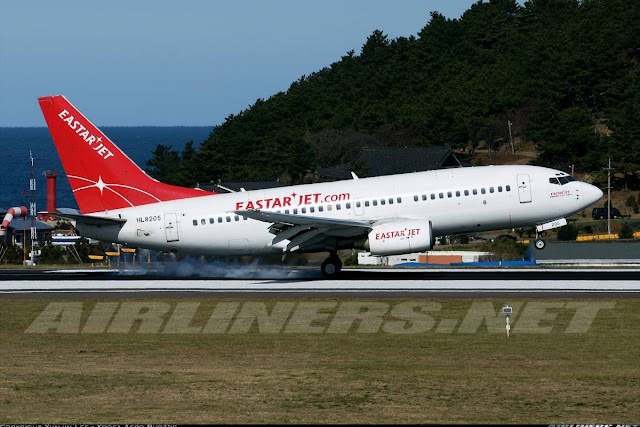 Flying on Eastar Jet's Boeing 737-700 from Jeju to Seoul Gimpo! My original plan was to book either with Jin Air or Asiana Air from CJU to GMP had failed miserably. The latter had caused so much frustration that I decided to just give up and book myself on Eastar Jet's Boeing 737-700 instead. This aircraft type is rare in South-east Asia and to fly on it again was a no-brainer. If the flight is operated by Boeing 737-800 instead, I would have booked with someone else. Checking from flightradar24, the flights were operated by this type so with that in mind, I went ahead and make my booking. Why can't booking process be fast and simple, Asiana Air, Jin Air (Korean language only for domestic flights), Jeju Air and Korean Air? Check out my trip report on my Eastar Jet's Boeing 737-800 Osaka Kansai to Seoul Incheon (International flight). Website is easy to navigate, no problem making my booking. The funny part is seat selection is allowed on this short flight, not my international flight KIX-ICN. I hope to ask one of their staff about this. As usual, one has to registered with the airline to get the discounted airfare. I paid around 54,000 Won which is reasonable! I chose the last flight of the day, about 2 hours after my Air Busan's arrival, that would give me some time to explore the airport. After arriving at Jeju Airport around 1950, from the aircraft to the land side took me less than 10 minutes, photography at the airport was allowed, so I went around to snap quite a number of photos, here they are. I walked to the check-in counters. Look at the number of flights to Gimpo, its insane! This was my check-in counter. The Airport Mall - Only shops inside, nothing much to see. There are some charging ports at the resting area. This is the international check-in area! Crowded with mostly PRCS, heading back to China. I had dinner over here, food was reasonably priced and was not bad. Walking pass the shops towards my gate. This airport isn't very big. My gate where my aircraft would be departing from. Unlike my T'way flight which took place the following day, we were to board the aircraft via aero-bridge. There is free-wifi at this airport, so you can check your email or do some work while waiting for your flights. My ride for the evening, thanks to flightradar! Boarding started early, the queue was organised. Folks were waiting patiently and everything went smoothly. That's how boarding should be like. The cabin is different from the Boeing 737-800; it has black leather seats. Legroom space was at 31 inch, normal for Low Cost Carriers. The crew didn't say a word when I took the photos, no problem at all! Look at how small the window is compared to the Dreamliner's. Did I enjoy myself on board? Yes I did! Service on board was great, the crew came around to check everyone was doing ok. You hardly see them chatting even at the rear. Being professional at all times. That's how service should be like! A complimentary drink was served! I apologise for the lack of window-shot photos. The ride was very smooth, from take-off to touch down, hardly a bump. The short 55 minutes ended very quickly and I found myself at Gimpo domestic terminal in no time. After flying with this airline for the 2nd time, I can strongly say that you don't have to worry much about this airline. Its safe and reliable. I am satisfied with my experience on both international and domestic flights with this carrier. Very glad to have added the Boeing 737-700 to my flight logbook, it was my 2nd time. Website is user-friendly even though its not the best. Just need to register in order to take advantage of the good offer, just like other Korean carriers. 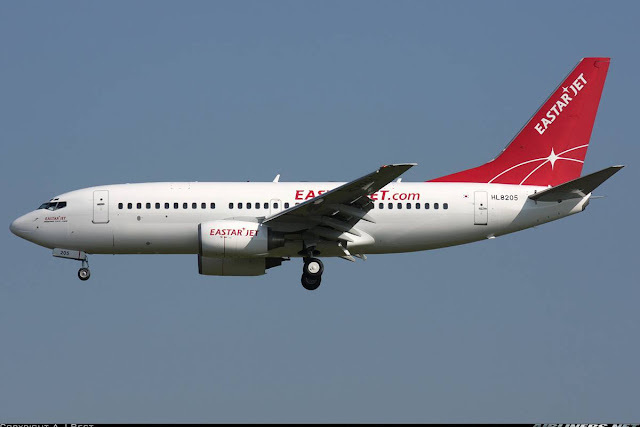 For me Eastar Jet is one of the top airlines in Korea, I will do another review on the airlines in Korea once I complete my joyrides with Asiana and Jin Air. Thank you for reading this trip report. Hope you enjoy it as much as I do. Hi! Did you have to login to eastarjet again a second time? I tried to confirm my reservation a few days after booking but been notified time and again that I had no reservation :/ From your experience, do I have to logon again or will printing the confirmation email and appearing at the boarding gate suffice? Thanks! When I did the booking, I registered online and logged in. After that I made my payment to take advantage of the low fare, no issue for me. Did you receive an email on your confirmed flight? If you didn't, your booking may not have gone through. Check with your CC company whether the booking went ahead. Let me know! Hi Charles! Great blog and very helpful info. I am trying to book a flight from Seoul to Jeju with EastarJet, but just before getting to the payment step, a file called "npisp_install.exe" downloads automatically. The same happened when trying to book the ticket with T'way airlines (which I tried in an attempt to avoid using that file). Did you experience the same? Is it some kind of payment program that is used in Korea? Thanks! Hi Monica! Glad you enjoy the report. Recently, I did a dummy booking with this airline and I had the same problem as you. My 2 previous flights with this airline, I didn't have to download any 3rd party in order to make the payment, it was straightforward. Try Jeju Air (No issue for me) or Air Busan, both airlines also fly from Gimpo to Jeju. Good Luck! May i know how long do you take from Icn to Gimpo airport before departing to jeju island? It takes 30 minutes by Arex train and 40 minutes by bus from ICN to GMP airport. If you are doing an airport transfer, I recommend at least 2 and a half hours of allowance for the transfer just in case of unexpected delay. Hi Charles, usually for domestic flight like Gimpo to Jeju, what time do you usually check in? 1 hour before boarding time is it okay? Planning for my Gimpo to Jeju flight after i land from SIN to ICN. I usually check in at least 2 hours before departure whether its domestic or international flight. 1 hour before boarding time is ok, but to play a bit safe especially you have to transfer from Incheon to Gimpo, give yourself more time for travelling just in case. 2 and a half hours including airport transfer should be safe. I have booked the domestic air ticket from Gimpo to Jeju Island via Eastar Jet airline on 26 march 2016. I checked my email and I have received the Flight Itinerary & Reservation No. and my credit card has also been charged with the amount. When I using member log in to Easter Jet, there is 1 reservation made and the status is "Confirmed" but i cannot print e-boarding pass and seats assignment. It's just bring the printing confirmation email to boarding? Bring the printed confirmation itinerary to the check in counter to get your boarding pass. I experienced the same as low low. I received the reservation email but didn't see any charges in my credit card. Are the reservation confirmation email consider as successful booking? Yes, as long as you received the confirmation email, your booking is completed. However, you should contact the airline regarding this to be on the safe side. I just want to ask regarding the contact number that you have entered while booking at eastarjet. Did you use your own number? Coz im having a problem when it comes to contact number. Im not from korea so when I entered my phone number it did not accept it. With that I can't continue with my bookings. I used my own number with the country code, I didn't have any issue. It seems a few others also have this issue. May I know which route are you flying on? You can consider flying with other Korean Low Cost Carriers such as Jeju Air, Air Busan or T'Way to save the hassle. We're planning to take the route gimpo to jeju then jeju to busan. I've checked the airlines you've suggested, they also have affordable flights. Though eastar jet is a lot cheaper. Anyway thank you so much! I am planning to book Easter jet, but i have a problem in payment. The website just receive payment with Korea credit card and e-credit. I dont have it. so, its means i can't book this airlines? I was able to book the website without issue at the time. Which route are you doing? I would suggest you to fly with other Korean carriers if you can. i choose esterjet coz they offer the price lowest than others and the time is perfect. Now i think Maybe i should book jeju air or tway air. which better do you think? Apparently not just you others also had problems booking with Eastarjet. My recommendation is fly with another airline to save all the trouble! Jeju Air and T'Way are good airlines, my preference is Jeju Air as I had a better experience with this airline! Okay. Thanks for sharing Charles. I am booking with Eastarjet for my trip to Jeju. My flight from Jeju to Busan is in the morning 10.25am. What time must I reach the airport. 9.00am, is it ok? I would arrive there by 8.45 a.m, just to be play safe. 9 a.m is fine, but a bit earlier would be better. Another great review Charles, I'll be flying the Eastar to Cheongju from Jeju tomorrow morning. Another Korean Airline to add to my list of Jin Air, Jeju Air, T-Way, and Korean Air. Hope you enjoyed your flight, James! We are renting a car in Jeju and our Eastar flight back to Seoul is at 10am. However, the car rental office opens at 8am, so we probably won't make it to the airport until 9am. Will we make it on time for the flight or are we pushing it? That would depends the distance between the car rental location and the airport. If you can get to the airport by 8.45 am, you should be safe. Any time later,it would be risky. If you can, try to change the flight to Seoul to a later timing. It's better to give yourself some more time to travel to the airport, just in case of any unexpected delay along the way.